MOSCOW (Reuters) - Russia's largest oil producer Rosneft almost tripled third-quarter net profit to 142 billion roubles ($2.2 billion), as higher crude output and prices outweighed impairments on downstream operations. The state-controlled company took a 133 billion rouble charge on refining and distribution operations. Russian fuel prices have lagged a surge in crude oil prices, and companies have also been forced by the government to cap politically sensitive retail fuel prices. Despite the big profit jump from the same period last year, Rosneft fell just short of analysts' expectations. Their average forecast in a Reuters poll was 147 billion roubles. Rosneft, which includes BP and Qatar among its shareholders, accounts for about 40 percent of Russia's oil output and is key to Moscow's efforts to forge closer ties with the Organization of the Petroleum Exporting Countries (OPEC). The company increased daily oil production in the third quarter by 3.4 percent year on year. A company official told a conference call that Rosneft planned to raise its liquid hydrocarbon production further next year, to 241 million tonnes, or 4.8-4.9 million barrels per day (bpd), up from 4.73 million bpd in the third quarter. The company also said it expected capital expenditure to rise by 20-25 percent in 2019 from around 900 billion roubles seen this year, due to the development of new upstream projects. Rosneft's shares were 5 percent higher in afternoon trade. Headed by Igor Sechin, a long-standing ally of Russian President Vladimir Putin, Rosneft has been pursuing acquisitions at home and abroad, amassing huge debts. In May, it announced a plan to cut debt and trading liabilities by a minimum of 500 billion roubles this year, partly by selling non-core assets. The company did not disclose its latest net debt figure, but analysts at Moscow brokerage BCS put it at $71.7 billion, down about 8 percent from the previous quarter. 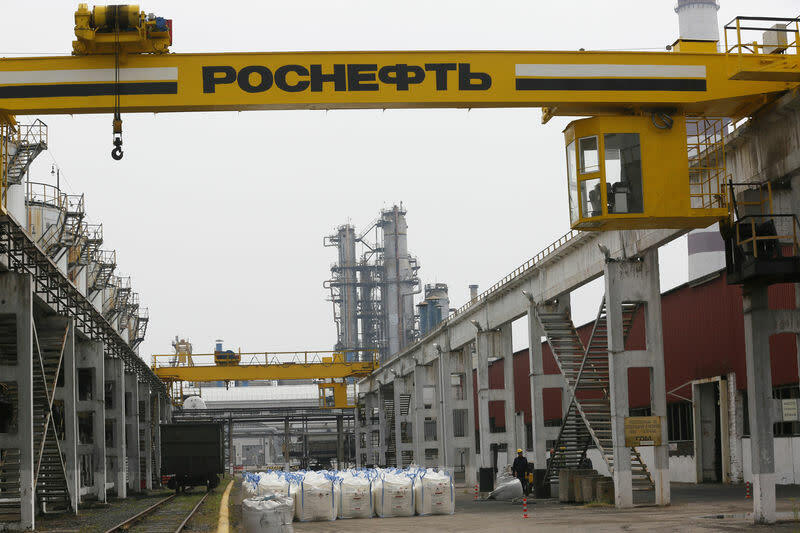 After the introduction of sanctions that shut the company out of Western capital markets, Rosneft switched to prepayment deals with international traders such as Trafigura. The company said it was owed $3.1 billion by Venezuela as of Sept. 30, down from $3.6 billion on June 30. It also said it owed $26.8 billion to traders under prepayment deals for its oil as of Sept. 30, down from $29.3 billion at June 30.